Circadian rhythms are oscillating physiological and behavioral changes governed by an internal molecular clock, and dysfunctions in circadian rhythms have been associated with ageing and various neurodegenerative diseases. However, the evidence directly connecting the neurodegeneration-associated proteins to circadian control at the molecular level remains sparse. Using meta-analysis, synchronized animals and cell lines, cells and tissues from FUS R521C knock-in rats, we examined the role of FUS in circadian gene expression regulation. We found that FUS, an oscillating expressed nuclear protein implicated in the pathogenesis of amyotrophic lateral sclerosis (ALS) and frontotemporal dementia (FTD), exerted a novel feedback route to regulate circadian gene expression. Nr1d1-encoded core circadian protein REV-ERBα bound the Fus promoter and regulated the expression of Fus. 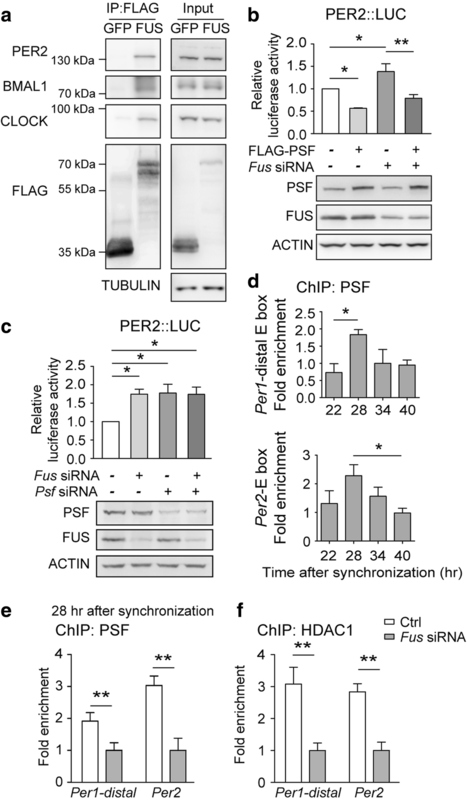 Meanwhile, FUS was in the same complex as PER/CRY, and repressed the expression of E box-containing core circadian genes, such as Per2, by mediating the promoter occupancy of PSF-HDAC1. 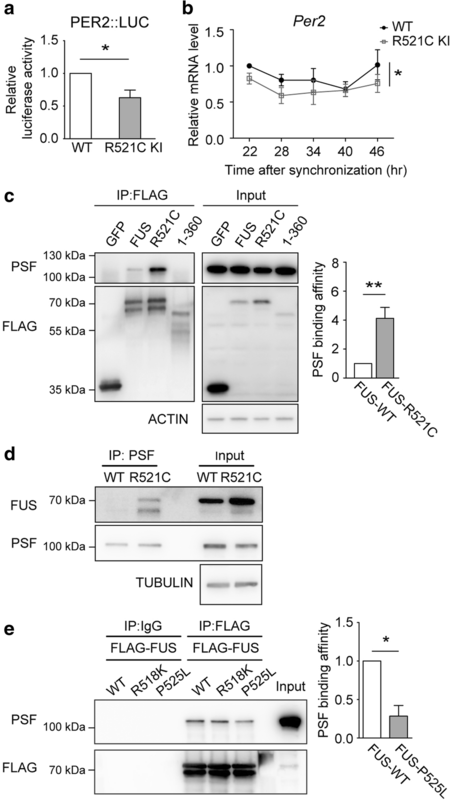 Remarkably, a common pathogenic mutant FUS (R521C) showed increased binding to PSF, and caused decreased expression of Per2. Therefore, we have demonstrated FUS as a modulator of circadian gene expression, and provided novel mechanistic insights into the mutual influence between circadian control and neurodegeneration-associated proteins. Circadian rhythms are oscillating physiological and behavioral changes governed by an internal molecular clock, and rely on two transcriptional feedback loops to regulate the expression of various core circadian genes [1–3]. BMAL1 and CLOCK transcriptionally activate E-box-containing genes, including Per, Cry and Nr1d1/2. When the protein products of Per, Cry and Nr1d1/2 build up, Nr1d1/2-encoded REV-ERBα/β can repress the transcription of Bmal1 by binding to retinoic acid–related orphan receptor response (ROR) elements in the Bmal1 promoter [4, 5], and PER and CRY proteins can join a mega-transcriptional repressor complex with BMAL1 and CLOCK to shut down the expression of E-box-containing genes [6–11]. The strength of these two major transcriptional feedback loops can be further fine-tuned by additional transcriptional co-regulators [12–14]. For example, RNA/DNA-binding protein PSF (also known as splicing factor proline and glutamine rich) could act as a transcriptional co-repressor by recruiting SIN3A-HDAC1 to rhythmically deacetylate Per1 promoter and repress the transcription of Per1. There is a plethora of evidence connecting circadian rhythm dysfunction to neurodegeneration [15, 16]. However, except for Ataxin-2 in Drosophila circadian locomotor behavior regulation [17, 18], there is little evidence mechanistically links neurodegenerative disease-associated proteins to the regulation of circadian clock. FUS is a nuclear protein implicated in the pathogenesis of ALS and FTD [19–21]. Mutations in FUS cause early onset of ALS, and the accumulation of FUS is a common feature in FTD neuropathology . Furthermore, sleep disorders are known to affect some ALS and FTD patients [22–24]. Fus is suggested as a potential circadian regulated gene with oscillating mRNA expression in mouse liver, prefrontal cortex, skeletal muscle and other tissues [25, 26]; however, its regulation by circadian clock has never been characterized and its role in circadian regulation is unknown. In this study, we found that FUS is not only transcriptionally regulated by REV-ERBα, but also modulates the expression of Per and Cry. Therefore, our study provides novel insights into mutual regulation between circadian control and neurodegeneration-related proteins. All animal works were performed in accordance with the regulations by the Animal Care and Use Committee of the Institute of Neuroscience, Shanghai Institutes for Biological Sciences. The detailed procedures for the establishment of the FUS-R521C knock-in rats via CRISPR/Cas9, and the characterization of the animals were described elsewhere (T.Z. et al, Neurobiology of Aging, in press; Additional file 1). Briefly, Cas9 mRNA, single guide RNA (sgRNA) targeting the C-terminus of rat Fus gene, and donor DNA were injected into the cytoplasm of zygotes of the Sprague Dawley rats (Additional file 1: Figure S1). The sequence for sgRNA and donor DNA are: TGAGCACAGACAGGATCGCA (sgRNA), TTAATCTAACAAATAATTTTTTCTTTCAGG GGTGAGCACAGACAGGATTGCAGGGAGAGGCCATATTAGCCTGACTCCTGAAGTTCTGGAACAGCTCTTC (donor DNA). The presence of inserted mutation was determined by PCR followed by sequencing. The potential off-target effects in F0 (founder) rats were estimated using Cas-OFFinder  and assessed by PCR-sequencing. Multiple rounds of breeding were carried out to eliminate off potential off target effects. The Nr1d1 knock-out mice were described previously . Rat embryonic fibroblasts (REFs) were collected from E13.5-15.5 embryos using pregnant rats from heterozygous R521C FUS knock-in rats mating pairs. Mouse embryonic fibroblasts (MEFs) were collected from E13.5-E15.5 embryos using pregnant mice from heterozygous Nr1d1 knock-out mice mating pairs. REFs, MEFs, HEK293T cells (ATCC) and Neuro-2a (ATCC) cells were cultured at 37 °C in 5% CO2 in DMEM (for REFs and HEK293T cells, Gibco c11965) or DMEM/F-12 (for Neuro-2a cells, Gibco c11330) medium, supplemented with 10% fetal bovine serum (Gibco, 10099) and antibiotics (Penicillin and streptomycin, HyClone, SV30010). Cells were transfected using Lipofectamine 2000 reagent (Invitrogen, 11668) for over-expression or Lipofectamine RNAiMAX (Invitrogen, 13778) for gene silencing. Control plasmids (GFP) or scrambled siRNA (Ctrl) were used to make sure equal amount of the constructs were transfected in each condition. Typically, cells were harvested 48 hrs for over-expression and 72 hrs for RNAi silencing after transfection. Neuro-2a cell were synchronized as described previously . Briefly, 48 hrs after siRNA silencing or 24 hrs after over-expression, the cultural medium for transfected cells were changed to 50% horse serum (Gibco, 16050)-50% DMEM/F12 for 2 hrs followed by culturing in 1%-FBS-containing DMEM for 22 hrs before harvesting. For REFs synchronization, 48 hrs after transfection, cells were cultured in DMEM (with 1% FBS and antibiotics) containing 10μM forskolin (Sigma, F3917) for 2 hrs, followed by culturing in the low serum condition until the end of the experiment (DMEM with 1% FBS) as described . The synchronization of MEFs was as described [29, 30]. MEFs were treated with 100nM Dexamethasone for 1 hr when cells reach confluence, then the cells were cultured in the low serum condition (DMEM with 1% FBS) for 36 hr followed by harvesting. For Fig. 1a-c, 7-week-old male wild-type C57BL/6 mice (SLAC Laboratory Animal, Shanghai) were maintained in a light-tight, ventilated, temperature (22 °C) and humidity (60%)-controlled animal facility with free access to food and water. The lighting schedule was 12 hr light:12 hr dark (lights on at 7 a.m.). To measure the endogenous circadian gene oscillation, entrained mice were then released to a constant low irradiance light condition (~30 Lux, measured at the bottom of cage) for one week. Starting at CT-8 (circadian time), five mice were sacrificed every 4 hrs, for 24 hrs. Tissues were quickly dissected and frozen immediately in solid carbon dioxide for further analysis. For Fig. 1d, the detailed method for sleep deprivation (SD) was as described . Briefly, SD was initiated at ZT-0 hr (Zeitgeber time), ZT-6 hr, ZT-12 hr and ZT-18 hr by gentle-handing method for 5.5 hrs, mice were then sacrificed within the next 30 min. For Fig. 2d, 3.5-month-old Nr1d1-knockout mice and littermate wild-type control mice were entrained in the 12 hr:12 hr light:dark condition for more than a week then released to constant dark condition for five days. Three pairs of littermate mice were sacrificed at CT-0 hr and two pairs of mice were sacrificed at CT-12 hr under the dim red light. Tissues were quickly dissected and frozen immediately in solid carbon dioxide for further analysis. Firefly luciferase reporter constructs directed by the intact mouse Fus promoter (~1.5kb upstream) or the promoter with predicted REV-ERBα-binding site (350 bp ) deleted were PCR amplified from mouse genomic DNA and cloned into firefly luciferase reporter vector (pGL3-Basic Vector, Promega, E1751). Firefly luciferase reporter constructs directed by mouse Per2 promoter (1.7 kb)  was a gift from Dr. Hung-Chun Chang’s lab. Cells were transfected with firefly luciferase reporter with renilla luciferase reporter (pRL-SV40 Vector, Promega, E2231) as internal control. According to the technical manual of Dual-Luciiferase Reporter Assay System (Promega, E1910), 48 hrs after transfection, cells were eventually lysed with Passive Lysis Buffer. Then, transferred 20μL of cell lysate into 100μL of LARII reagent and the luminescence of firefly luciferase reporter was read by the tube luminometer (Titertek Berthold). Next, added 100μL of Stop & Glo reagent and put the tube back to the luminometer again and read the luminescence for internal renilla luciferase control. For each experiment, samples were analyzed in duplicates. Sequences of siRNAs were listed in Additional file 2: Table S1. FLAG-mouse REV-ERBα and FLAG-PSF, FUS, R521C and 1-360 FUS were generated by PCR cloning. The primary antibodies used are: rabbit anti-PSF (Sigma, PLA0181; WB: 1:2,000, IP: 1:100; ChIP: 1:100), mouse anti-FUS (Santa Cruz, sc-4H11; WB: 1:1,000), mouse anti-DYKDDDDK-Tag (FLAG) (Abmart, M2008; WB:1:5,000), mouse anti-DYKDDDDK-Tag conjugated protein A/G beads (Abmart, M200018; IP and ChIP: 35uL beads per each assay), mouse anti-PSF antibody (Sigma, P2860; WB: 1:1,000), rabbit anti-CLOCK (Cell Signaling Technology, D45B10; WB:1:3,000), rabbit anti-BMAL1 (CST, D2L7G; WB: 1:3,000), rabbit anti-PER2 (Abcam, ab179813; WB: 1:1,000), mouse anti-ACTIN (Abmart, M20010; WB: 1:5,000), rabbit anti HDAC1 (Abcam, ab7028; ChIP: 1:150; WB: 1:2,000), mouse anti-TUBULIN (Abmart, T40103; WB: 1:5,000), mouse-anti GAPDH (Proteintech, 60004-1-Ig; WB: 1:10,000). Primer sequences are included in Additional file 2: Table S1. The procedure for western blotting was as described previously . Briefly, animal tissue samples or cultured cells were lysed in RIPA buffer (150 mM NaCl, 50 mM Tris buffer (pH=8.0), 1% NP-40, 1% deoxycholate and 0.1% SDS) with protease inhibitors (Roche, 5892970001). After centrifugation at 12,000 rpm for 15 min at 4 °C, the concentration of soluble fraction was measured by BCA Protein Assay Kit (Tiangen) and the soluble fraction was boiling in 5× loading buffer at 100 °C for 15 min. Around 40 μg of protein was loaded per lane for western blotting. The procedure for immunoprecipitation was described previously with minor modification . Briefly, transfected HEK293T cells (10 cm-plate, 48 hrs after transfection) or the whole brain of rats were lysed in NP-40 buffer (150mM NaCl, 1% NP-40, 50 mM Tris buffer (pH=8.0) and 0.25% deoxycholate) with protease inhibitors. After centrifugation at 12,000 rpm for 15 min at 4 °C, 1 mg of protein lysates were pre-cleaned with IgG for one hour, followed by incubation with the mouse anti-DYKDDDDK-Tag conjugated protein A/G beads (Abmart, M200018) overnight. Pre-cleaned brain lysates were incubated with primary antibodies or control IgG overnight, followed by incubation with protein A/G sepharose beads (Santa Cruz, sc2003) for one hour. The beads were then washed and immunoprecipitated proteins were eluted by boiling in loading buffer. ChIP assays were performed with serum-shocked synchronized Neuro-2a cells as previously described . Briefly, Neuro-2a cells cultured in 15-cm plates were washed twice by PBS and cross-linked with 1% formaldehyde for 15 min. Cross-linked cells were washed by ice-cold PBS and collected. The nuclear fractions were extracted by high-salt buffer followed by sonication three times for 10s at the maximum setting (SCIENTZ, Scientz-II D). The fragmentation of sonicated chromatin was evaluated by agarose gel electrophoresis and the sonication condition was optimized to achieve ideal fragment size of 200 – 1,000 bp. After centrifugation for 10 min at 12,000 rpm, the supernatants were immunocleared with 2μg sheared salmon sperm DNA (Sigma, D1626), IgG and protein A/G sepharose beads for 2 hrs at 4 °C, and immunoprecipitated with indicated antibodies overnight followed by incubation with salmon sperm DNA and protein A/G sepharose beads. Precipitates were de-crosslinked at 65 °C for 8 hrs and DNA was purified with Universal DNA Purification Kit (Tiangen, DP214) and used in quantitative PCR. For qPCR, 1.5 μL from 60 μL DNA extraction were used with specific primer pairs (Additional file 2: Table S1) and SYBR Green (BIO-RAD, 170888). For Fig. 1d, Fus expression pattern in sleep deprived mouse brain was obtained from GSE9442 . For Fig.1e and f, mouse liver and brain stem circadian microarray data were from GSE119237  and GSE54650  respectively. The circadian oscillation of gene expression was determined by fitting the circadian time-series data to cosine functions with 24 hours’ period and shifting phases as described previously . For Fig. 2a, REV-ERBα and REV-ERBβ ChIP-seq data in mouse liver were mapped to mouse genome (mm9) by bowtie2 program  (default parameters). MACS program  was applied to identify the binding sites (MACS 1.4.2, default parameter) from ChIP-seq data. For Fig. 2f, BETA program  were applied to evaluate the activating/repressive function of REV-ERBα in mouse liver from the genome-wide data (with parameters:--df=0.05 -d 30000 -k BSF --da 500). Data are presented as mean ± s.e.m. and were analyzed by Prism 7 software (GraphPad). Two-tailed unpaired t-test was used to compare the means of two groups. One-way ANOVA followed by Newman-Keuls multiple comparisons test was used for multiple comparisons. Two-way ANOVA followed by Sidak multiple comparison test was used for analysis gene expression in various time points. We first examined the protein expression of FUS in various mouse tissues, including the peripheral circadian clock center liver [42, 43], hypothalamus which harbors central circadian pacemaker suprachiasmatic nucleus, and cortex (Fig. 1a-c). FUS expression showed clear circadian oscillation although the patterns varied in different tissues. Since sleep deprivation (SD) affects the expressions of many core circadian genes [31, 45, 46], we compared the expression of Fus in the normal and SD conditions by a meta-analysis of published microarray datasets  (Fig. 1d). The basal level of Fus mRNA was decreased and oscillation amplitude was diminished in sleep-deprived mice (Fig. 1d). These results suggested that the expression of Fus was regulated by circadian clock. Furthermore, the oscillation of Fus expression was much stronger than Tdp-43, another ALS and FTD-associated nuclear protein [47–50] in mice, suggesting that FUS may exert a more active role in circadian rhythm (Fig. 1e, f). To investigate the underlying mechanism of circadian regulation of Fus, we performed a bioinformatics analysis of published ChIP-seq datasets of core circadian proteins and found that only REV-ERBα, not even REV-ERBβ, bound within a 350 bp region in the Fus promoter , although the Fus promoter lacked a consensus REV-ERBα-binding site, the retinoic acid–related orphan receptor response (ROR) element (Fig. 2a, Additional file 3: Table S2). We confirmed the binding of REV-ERBα to the Fus promoter using chromatin immunoprecipitation (Fig. 2b). Silencing the gene encoding REV-ERBα, Nr1d1, reduced the expression from the Fus promoter, and deletion of the REV-ERBα-binding region relieved the effect of Nr1d1 silencing (Fig. 2c). Intriguingly, removing the 350 bp region containing the REV-ERBα-binding site led to a REV-ERBα-independent increase of Fus promoter-luciferase activity, indicating that this region harbored a repressor-responsive element. Furthermore, the protein expression of FUS was reduced in Nr1d1 knock-out MEF cells (Fig. 2d) as well as in the liver of Nr1d1 knock-out mice (Fig. 2e), although the number of Nr1d1 knock-out mice in our experiment was restricted by limited availability due to reduced fertility of these mice [5, 51]. Although REV-ERBα was usually reported as a transcriptional repressor , it regulated FUS as an activator in a way very similar to a Drosophila Nr1d1 homolog, E75 , suggesting its versatile action depending on the presence of other transcriptional co-factors. To evaluate the global transcriptional regulation by REV-ERBα, we conducted an activating/repressive functional prediction analysis  based on the published REV-ERBα ChIP-seq data  and transcriptional profile from the Nr1d1 knock-out mice , and found that REV-ERBα could activate a large number of genes it binds (Fig. 2f). These results indicate that Fus is a REV-ERBα-regulated circadian gene. The diurnal expression of core circadian genes, such as Per and Cry, are regulated by complicated negative feedback loops involving transcriptional and post-translational regulation [1–3]. Since FUS is nuclear protein known to regulate gene expression , we assessed whether FUS may affect the expression patterns of some key genes in circadian control. We knocked-down the expression of endogenous Fus in synchronized Neuro-2a cells and found the mRNA levels of Per2 and Cry1 were generally increased with silenced expression of FUS at various time points during a diurnal cycle (Fig. 3a-c). Conversely, restoring the expression of FUS blunted the activation of Per2 and Cry1 by FUS depletion (Fig. 3d, e). These results suggest that FUS is a potential circadian regulator. We have previously shown that FUS interacts with PSF . Interestingly, PSF is in the PER/CRY, BMAL1, CLOCK protein complex and negatively regulates the expression of Per1 by recruiting the Sin3A-HDAC1 complex . Using co-immunoprecipitation assay, we found that FUS could similarly bind PER2, BMAL1, and CLOCK (Fig. 4a). To evaluate the possibility that FUS and PSF may cooperatively repress Per2 promoter-luciferase activity, we transfected PSF, in the presence or absence of FUS RNAi construct, and found that over-expression of PSF could reduce the Per2 activation by FUS RNAi (Fig. 4b). Next, we found that while the knock-down of either FUS or PSF led to increased Per2 promoter-luciferase activity, double knock-down did not produce an additive effect, suggesting that PSF and FUS operate through a common repressor complex (Fig. 4c). After analyzing the promoter loading of PSF at different circadian time in synchronized Neuro-2a cells, we found that during the observation window between 22 to 40 hrs after synchronization, the 28-hr time point showed the peak PSF binding (Fig. 4d). We then assessed the effect of FUS on the loading of PSF and HDAC1 onto the promoters of Per1, and Per2 at this time point. FUS depletion led to reduced promoter occupancy of PSF and HDAC1 (Fig. 4e, f). Collectively, our results indicate that FUS may facilitate the recruitment of co-repressor complex PSF-HDAC1 to the promoters of Per genes. Mutations in Fus cause early onset of ALS and FTD [19–21, 55–57]. To evaluate whether pathogenic mutations may affect circadian regulation by FUS, we examined the expression of Per2 and Bmal1 in REFs derived from FUS R521C knock-in rats available in the lab. R521C is one of the most common FUS point mutations [58–61]. Both the Per2 promoter activity and mRNA expression were decreased (Fig. 5a, b).We then assessed the interaction between PSF and FUS-R521C. We found that FUS-R521C showed a much stronger binding to PSF than the wild-type FUS and the binding between FUS and PSF required the C-terminus of FUS (Fig. 5c). Furthermore, we confirmed the increased binding between FUS R521C and PSF in the brain tissue from FUS-R521C knock-in rats (Fig. 5d). We have also detected the binding between PSF and other two C-terminus-located FUS pathogenic mutations, R518K and P525L (Fig. 5e). Surprisingly, unlike R521C, FUS P525L showed significantly weaker binding with PSF than wild-type FUS (more in Discussion). Taken together, our results suggest that mutations in Fus could lead to abnormal circadian gene expression. In summary, we have identified ALS/FTD-associated FUS as a novel modulator for the circadian gene expression. The FUS expression is positively regulated by REV-ERBα. Meanwhile, FUS is a component of the PER-CRY-BMAL1-CLOCK mega-complex, and it represses the expression of Per by recruiting PSF-HDAC1. Therefore, besides transcriptionally repressing Bmal1, REV-ERBα could negatively regulate the expression of Per genes via the action of FUS. 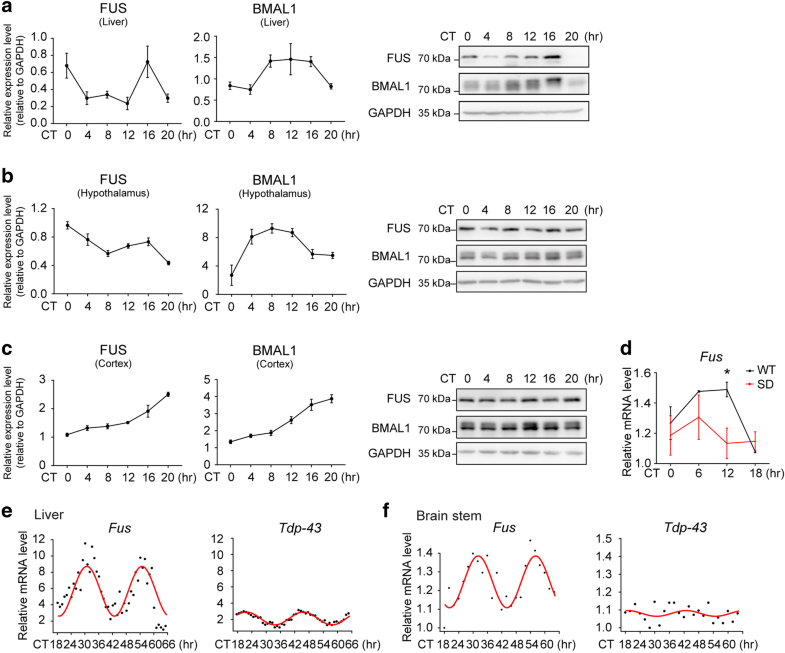 The regulation of FUS by REV-ERBα suggests that dysregulated circadian clock could lead to the abnormal expression of FUS, as demonstrated by the reduction of FUS expression in sleep-deprived mice (Fig. 1d). Since the change in Fus expression is detrimental to neuronal health and contributes to the pathogenesis of ALS and FTD [58, 62, 63], our results have provided new mechanistic insights into the role of circadian dysfunction as a risk factor for neurodegeneration. Because of the importance of FUS, dramatic fluctuation of FUS would not be desirable for the organism. It is not surprising to observe the moderate but reproducible regulation of FUS by REV-ERBα. In addition, it is possible that other circadian regulators may also participate in the regulation of FUS expression. Although we have described a mechanism related to the transcriptional regulation by FUS, other functions of FUS could also contribute to circadian gene regulation. For example, FUS is a key regulator in RNA splicing [64, 65]. However, published RNA splicing targets by FUS do not contain core circadian genes . Whether the RNA-binding property of FUS is involved in circadian gene regulation remains to be elucidated. Our data suggest that the FUS C-terminus, a mutation hot spot , may mediate the binding between FUS and the PSF-containing protein complex. Consistent with a recent report , pathogenic mutations such as R518K and P525L (Fig. 5e) could affect the binding between FUS and PSF. 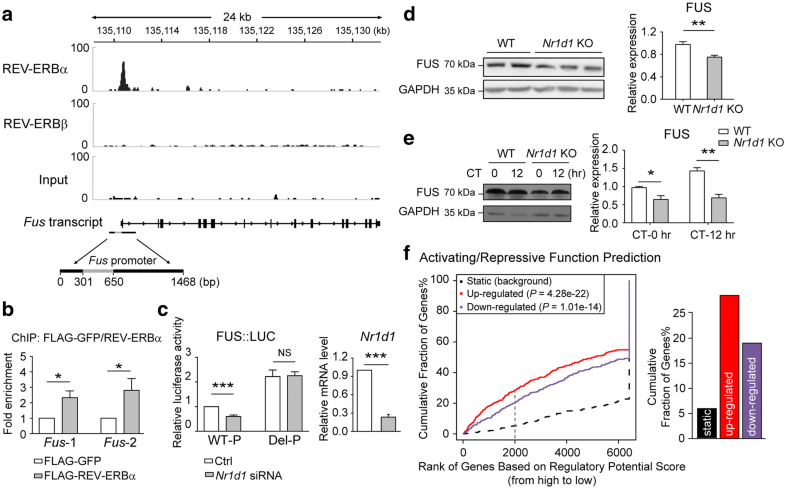 Therefore, some pathogenic mutations in Fus will conceivably lead to altered recruitment of the repressor complex and affect the transcription of core circadian genes. It will be of great interest in the future to determine whether FUS mutation-induced circadian gene dysregulation may contribute to or further exacerbate the neurodegeneration process. We have identified ALS/FTD-associated FUS as a modulator of circadian gene expression, and provided new mechanistic evidence supporting the mutual influence between circadian disturbance and neurodegeneration. We thank Dr. Ying Xu (Soochow University) for providing the Nr1d1 knock-out mice. This work was supported by Hundreds of Talents Program to J.X. and H.C.C, Chinese Academy of Sciences; Shanghai Pujiang Talent Program (12PJ1410000) and National Natural Science Foundation of China grant (81771425) to J.X. ; Chinese Academy of Sciences Strategic Priority Research Program Grant (XDB02060006) and National Natural Science Foundation of China Grant (31571209) to J.Y. ; Natural Science Foundation of Shanghai Grant (16ZR1448800) to H.F.W. XJ and JX designed research, XJ, TZ, HFW, TW, MLQ, PBH, RQW, YWL performed research, XJ, TZ and JX analyzed data, and HFW and JY performed bioinformatics analysis. HCC contributed crucial reagents and provided key discussion. JX and XJ wrote the paper with input from co-authors. All authors read and approved the final manuscript.